673. Federer and Djokovic are frauds of the first order. We live in a time where there is a duplicate product for every original. Brands like Nike and Reebok have duplicate products that look almost similar. The first copy products will indeed have same brand names and many buyers fall for it. In the movie Industry, many movies are shamelessly copied from other films. The recent blockbusters in Tamil- Sarabam and Jigirthanda are shamelessly copied from foreign language movies. But still the copied versions seem to be lot better than the original ones. Dhoni is known for his Helicopter shots. But Sachin Tendulkar invented it long before Dhoni made it popular. At times, the copy cats become popular than the original inventors of a particular subject. This has been the case with Federer and Djokovic. These two tennis players are indeed the best players of the current generation. Federer is known for his passing shots and his volleys. Djokovic is known for his comic acts and is called as the Joker by tennis enthusiasts. Even though these two are great tennis players, they have shamelessly copied two shots and made it their own without giving due credit to the original inventor of the shot. Federer has popularised the Tweener shot (shot between the legs). Djokovic has popularised the behind the back shot. But they have never ever admitted that they copied these shots from Puratchi Thalaivar Dr. MGR. 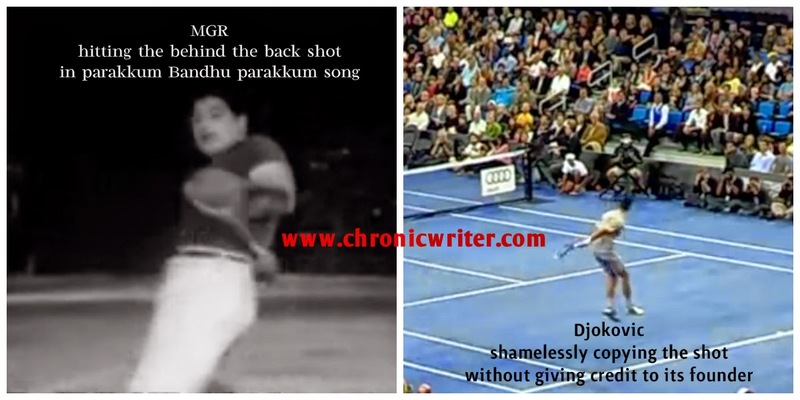 Dr. MGR played these two shots while playing an epic ball badminton match against International women's champion B Sarojadevi in the song "Parakkum Bandhu Parakkum". 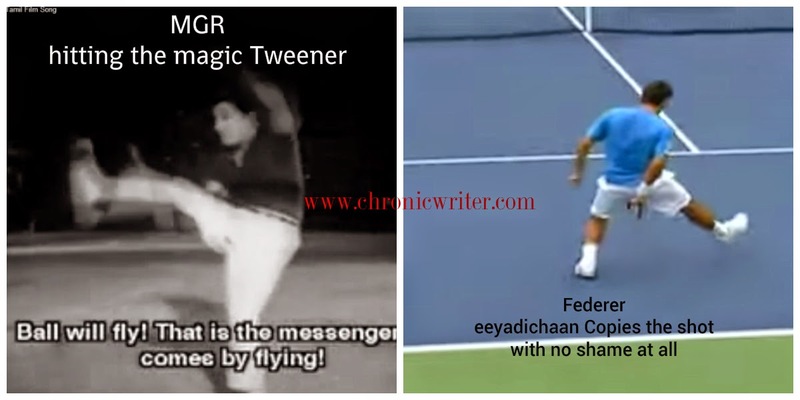 It is believed that Federer and Djokovic watched youtube videos of the song and decided to copy those shots. They might use these shots in this year's US open tennis tournament too. ha ha ha... :) awesome!